New to the rental market this great modern 2 bedroom flat is located on the 2nd floor of the attractive and well located Artisan building. It is fully furnished, has a stylish feel and feels bright and airy throughout. The building is located at the bottom (quiet) end of Kelvinhaugh Street, literally minutes walk from Yorkhill Hospital, Kelvingrove Park and the trendy bars in the Finneston area. Private parking, a lift and security video door entry benefit the property. Secure entrance with lift access- the flat itself has good hallway, spacious and bright open plan kitchen through to living /dining area, kitchen with integrated appliances including oven, hob, extractor hood, fridge freezer, dishwasher, washer dryer and granite worktop, living area with great space to relax and dine in. 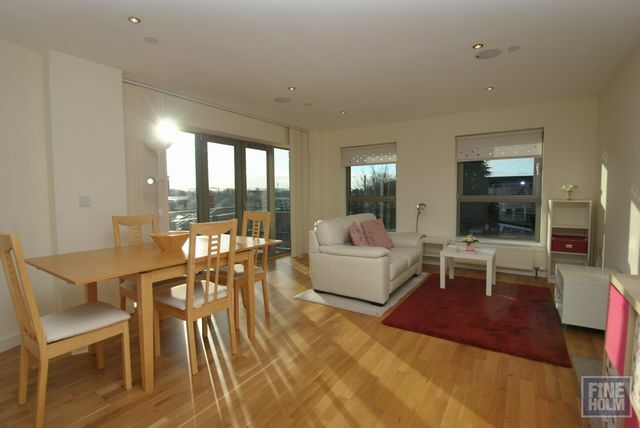 Double aspect windows make it very light with a private balcony offering great views. The master bedroom has spacious wardrobe space and ensuite shower room, second double bedroom again with fitted wardrobe space and family bathroom with shower over bath . Generous storage cupboard. GCH. Double glazing. Situated immediately off Argyle Street which offers a range of social and recreational opportunities together with easy and good public transport links, well placed for Glasgow University, local hospitals, main road links namely the Clyde Tunnel, Clydeside Expressway, M8 motorway network. Fantastic flat for professional sharers or a couple looking to be close to West end and the city alike!